The headline inflation rate continued to rise for the week ended June 21. It soared to 11.63 per cent as compared to 11.42 per cent for the previous week. According to wholesale price index (WPI) data released today, the annual inflation rate was 4.32 per cent during the corresponding week of the previous year. The markets that were in oversold territory for the past several trading sessions welcomed news of the Samajwadi Party announcing that it would extend support to the UPA government at the Centre, with the Sensex surging 359 points to close at 13,454 levels. The Supreme Court today issued a notice to a developer on a petition filed by a Sahara group company challenging the Bombay High Court's order that stalled its plans to build 200 bungalows and a golf course on 600-acre land in Mumbai's outskirt. The spat between the Ambani brothers - Mukesh and Anil - over the latter wanting to acquire a majority stake in the South African telecom giant MTN through the ADA Group, RCom, seems to be getting murkier. After the Mukesh Ambani-controlled RIL shot off a fresh letter to RCom and MTN yesterday. Belying fears of economic slowdown impacting government revenue, direct tax collections have gone up by 38.6 per cent in the first quarter this fiscal at Rs 57,373 crore compared to Rs 41,391 in the year-ago period. Global retail major Marks & Spencer's proposal for 51 per cent foreign direct investment in single brand retail business is among the 28 proposals totalling Rs 1,327.7 crore that have been approved by the government. Telecom major, Bharti Airtel, will now foray into media and entertainment with the launch of its direct-to-home (DTH) service. The service will be launched through a subsidiary, Bharti Telemedia, in the coming months. 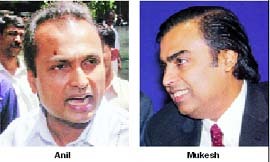 Two aircraft, a Falcon Air and an Airbus, employed for the use of Reliance Industries chairman Mukesh Ambani and senior officials of the company were seized by the Air Intelligence Wing of the Customs Department on Wednesday night for allegedly evading customs duty and returned later today. According to sources, the two aircraft were imported by Reliance Commercial Developers Pvt Ltd for purposes of operating them as charters. However, they were used exclusively by senior RIL officials. Attempting to defy all allegations of causing high toxicity in the Sutlej that led to death of hundreds of fish, dyeing units here said they were treating their effluent as per pollution control board's norms and were open to any inspection in this regard. Industrialists also sought detailed investigations into the reasons that led to the death of fish. Private equity firm ICICI Venture, a unit of ICICI Bank today said it has reached an agreement with Tishman Speyer to sell its stake in their real estate joint venture to the US firm. Telecom minister A Raja today said the guidelines for Third Generation Mobile Services (3G) and WiMax will be out in a weeks' time after consultations with finance ministry. The textile industry of the country is faced with a serious crisis, following steep hike in prices of cotton. The cotton prices have witnessed an unprecedented rise due to its uncontrolled export, thanks to the generosity of the government. The headline inflation rate continued to rise for the week ended June 21. 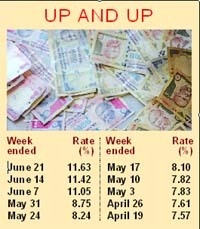 It soared to 11.63 per cent as compared to 11.42 per cent for the previous week. According to wholesale price index (WPI) data released today, the annual inflation rate was 4.32 per cent during the corresponding week of the previous year. The WPI for all commodities for the week ended June 21 rose by 0.4 per cent to 237.1 (provisional) from 236.1 (provisional) for the previous week. The index for 'primary articles' group rose by 0.5 per cent to 244.3 (provisional) from 243 (provisional) for the previous week. The index for 'food articles' group rose by 0.6 per cent to 233.6 (provisional) from 232.1 (provisional) for the previous week due to higher prices of tea (four per cent), fruits and vegetables, maize, bajra and fish-marine (two per cent each) and urad, moong, condiments and spices and jowar (one per cent each). However, the index for fuel, power, light and lubricants group declined by 0.1 per cent to 374.4 (provisional) from 374.7 (provisional) for the previous week due to lower prices of furnace oil (two per cent). The index for 'manufactured products' group rose by 0.5 per cent to 203.9 (provisional) from 202.8 (provisional) for the previous week. The index for 'food products' group rose by 0.9 per cent to 210.6 (provisional) from 208.8 (provisional) for the previous week due to higher prices of unrefined oil (eight per cent), cotton seed oil and rice bran oil (five per cent each), oilcakes (three per cent), and gingelly oil and imported edible oil (one per cent each). However, the prices of atta declined (two per cent) . In the broader markets, the Nifty was up 2.3 per cent to close above 4,000 mark, at 4,016 levels. The buoyancy in the markets came despite the inflation rate showing an increase of 11.63 per cent in the week ending June 21 as against 11.42 per cent the week earlier. Among the major gainers today included companies in the capital goods, realty, banking, oil & gas and IT sectors. Today's major Sensex gainers included Reliance Communications, which was up 12.5 per cent to close at Rs 438. Other major gainers include Jaiprakash Associates, which gained 10.7 per cent at Rs 153. DLF was up 8.6 per cent to close at Rs 414. Among sectoral indices, the BSE capital goods index was the biggest gainer closing 654 points or 6.5 per cent higher. Punj Lloyd, Alstom Projects and Siemens India were the major gainers. The bench sought reply from builder B Jeejeebhoy Vakharia and Associates and others in two weeks. The developer also gave an undertaking that it would not create any third party rights till the next date of hearing. The spat between the Ambani brothers - Mukesh and Anil - over the latter wanting to acquire a majority stake in the South African telecom giant MTN through the ADA Group, RCom, seems to be getting murkier. After the Mukesh Ambani-controlled RIL shot off a fresh letter to RCom and MTN yesterday, invoking the arbitration clause under the non-compete agreement with ADAG, the Anil Ambani group today asked market regulator SEBI to probe hammering down of shares of RCom. The ADAG alleged that this was being orchestrated by other rival companies and charged RIL with attempting to derail ongoing talks for a deal with MTN. The ADAG today wrote a letter to SEBI seeking a probe into the dip in shares of RCom, which had touched a 52-week low of Rs 381.05 yesterday. The latest round of spat comes weeks after the initial salvo fired by RIL, where it said that as per the agreement reached during the division of Ambani empire it was agreed upon that RIL would get the first right to refusal in case of selling of shares of the RCom. RIL also threatened litigation to ensure that this clause was implemented, and accordingly also wrote to MTN. ADAG has now charged RIL with desperate attempts to derail discussions with MTN and also accused rival interests of market abuse to impact valuations. In the statement issued yesterday, RIL said, "RIL has invoked the provisions of dispute resolution contained in the non-competition agreement dated January 12, 2006, and has invited RCom to participate in the process of mutual conciliation prior to commencement of formal arbitration". The second communication by RIL could actually cast a shadow on negotiations between MTN and RCom, both of whom are seeking to extend the exclusivity agreement for talks for the deal. The initial exclusivity agreement comes to an end on July 8, the time by which RCom is not expected to raise the finances needed to buy out the MTN shares. ADAG has also said that RIL was undermining Anil Ambani’s efforts to create a global telecom giant worth $70 billion with strong Indian roots by merging RCom and MTN. It would create the world’s seventh largest telecom company. Reports yesterday had suggested that RCom-led consortium would again look at buying out a 51 per cent stake in MTN in order to avoid any legal disputes with his elder brother. Earlier, reports had said that it could be MTN acquiring a majority stake in RCom, after which Mukesh Ambani’s Reliance Industries warned of a legal action in letters sent to South African telecom firm and RCom. "The growth in direct taxes has been maintained despite much larger refund payouts at Rs 11,578 crore against Rs 7,302 crore during the corresponding period last fiscal," said a finance ministry statement issued here today. Analysts said robust tax collections are expected to help the government maintain fiscal deficit at 2.5 per cent during 2008-09 despite increase in expenditure in the election year. During the first three months, corporate taxes have grown by 32.65 per cent and stood at Rs 34,566 crore against Rs 26,058 crore in first quarter last fiscal. Personal income tax, including fringe benefit tax (FBT), securities transaction tax (STT)and banking cash transaction tax (BCTT) grew by 48.84 per cent and touched Rs22,782 crore as against Rs 15,306 crore a year ago. This was stated by the president and CEO of Airtel, Manoj Kohli, during an interaction with The Tribune, here today. He said the company was in the final stages of trials for launching its satellite TV across the country, and Internet Protocol Television (IPTV) in the national capital region. The company could manufacture the set-top boxes through its own manufacturing arm, Bharti Teletech, or could be outsourced through multiple units. “We may not have the early bird advantage in DTH, but we will launch the best quality service,” said Kohli . Talking about the broadband service of Airtel, he said they would be launching this service across 95 cities and increase their penetration in these cities. “In the telecom business, the company was focusing on superior quality, improving distribution network and IT systems. Innovation will be the key for future growth in the mobile telephony, which is why we have launched five platforms — Bollywood downloads, music, sports, games and M-commerce. In the coming six months, we will be launching a flurry of M commerce products, besides the bill payment and money transfer that is already there,” he said. Kohli agreed that the growth for all telecom companies would now come from the rural sector. “We are already present in 3.5 lakh villages and in the next two years, propose to cover 90 per cent of the villages. In Punjab, we are present in 11,300 villages (of a total of 12,500) and in Haryana, we have covered 5,600 of the total 7,000 villages,” he added. As per the prevailing customs duty rates, aircraft imported for purposes of charter are levied lower customs duty than those bought for personal transportation. Confirming the incident, RIL said in a statement that the customs authorities had sent out notices to various non-scheduled operators. "As a part of this routine procedure, two of Reliance Commercial Developers Pvt Ltd's aircraft were detained and handed back to the company thereafter. Reliance is fully complying with all procedures as notified by the authorities," the statement said. According to sources, senior officials of RIL were also questioned as to the purpose of the use of the aircraft. The customs officials are also believed to have made a demand for additional duty of nearly Rs 95 crore. Representatives of this industry said the effluent discharged by them was less than 10 per cent of the total discharge of Ludhiana and fish may have died due to pesticides as well. "We regret the blame. The fact is that the water reservoir at Hari Ke Pattan, where fish died, gets water from multiple sources and number of cities, therefore, treated industrial effluent of Ludhiana's textile dyeing industry, which constitutes only a fraction of total water cannot lead to the death of fish. It is a baseless allegation against th industry," said V.K. Goyal, chief executive of Vardhman Spinning and General Mills, who is the spokesperson of Federation of Dyeing Factories Association. The association, that has 200 members, also held a meeting to discuss the issue. Members of the association said the treated industrial effluent of Ludhiana eventually flowed into Sutlej through Budha Nullah and municipal sewer installed by municipal corporation. "There have been no reports of fish dying in Sutlej river before its confluence at Hari Ke Pattan. This clearly proves that the factors leading to dying of fish are other than the treated industrial effluent." ICICI Venture will sell its 50 per cent stake in TSI Ventures India Pvt Ltd, a real estate joint venture company, to Tishman Speyer, which will now become the sole owner, a company statement today said Tishman Speyer and ICICI Venture will remain equity partners in TSI's three current projects,it added. On the ongoing controversy of Blackberry, the minister said the Department of Telecom (DoT) is separately looking at third-party solution to address security concerns regarding the Blackberry network. "Broad guidelines for 3G and WiMax have been devised and but they need some inputs from the finance ministry and after that the guidelines will be sent to the Telecom Commission and I expect the norms to be announced within a week. I will meet FM and PM before that," Raja said on the sidelines of a function here. He said consultation with the finance ministry is necessary as the ministry has a say in the Telecom Commission, the policy making wing of the DoT. After the consultation is over, the guidelines would be sent to the Telecom Commission for notification, he said. The rise in prices of cotton has taken place despite the fact that the country has recorded the highest cotton production of 315 lakh bales during the year 2007-08 against the production of 287 lakh bales of the year 2006-07. The textile industrialists are worried over the emerging situation and feel that the industry is faced with the threat of closure. The textile mills in south India have already started reducing their production, according to D.L. Sharma of the Vardhaman Textile Group. The international traders of cotton from the European countries and the USA had opened their offices in Mumbai and Delhi and made bulk purchase of cotton, which was mainly exported to China, followed by Pakistan, Bangladesh, Indonesia, Thailand and Turkey. Enquiries made by the reporter today revealed that the government changed the policy of export of cotton under the open general licence (OGL) policy. No mechanism was formed to keep an eye on the export of cotton by the international traders. According to Sharma, the cotton prices (ginned cotton) are to the tune of Rs 2,900 per maund against Rs 2,000 per maund last year. The government did not give any relief to the textile industry and rather imposed import duty of 14 per cent on it. The Confederation of Indian Textile Industry (CITI), in a memorandum to the Union finance minister and commerce minister, has pointed out there is heavy hoarding of cotton by international traders and it is a matter of great concern.